After leaving Waikokowai, we had a tour of Hobbiton in Matamata. It’s a 2-hour fully guided tour so there’s nothing much to say about it, except that it was a bit surreal to be walking amongst Hobbit holes. One of the most interesting aspects of the tour was how they created a fake tree and imported silk leaves from Taiwan to create the perfect tree that would look like a younger version of an old tree that would also feature in the film! Once we had tucked into a hearty lunch at the Hobbiton café (pretty good food!) we headed off to Tauranga. We had the privilege of our friends Barry and Shona offering us to stay in their apartment in Mount Maunganui. Apparently, I had gone there as a child, as my dad still remembers me asking non stop “Are we there yet?” on our road trip in our VW Beetle in the 1970s. Coincidentally, we are also driving a VW (Touareg, this time) and have Google Maps, so we can actually say “we will reach there in 43 minutes, so keep quiet!” to our kids this time round. On our way there, we stopped at the Maclaren Falls dam, where we saw a few teenagers jumping off the bridge into the water below…needless to say we were both awed and terrified that our oldest kid could be doing that in about 4 years’ time...not! Woohoo! Teens jumping off the bridge (actually not allowed) into Maclaren Falls. Scrambling around the rocks (as more practice for our hikes to come) we came across another family from Singapore who were also staying in Mount Maunganui! The kids were pretty fearless, which we are grateful for, as growing up in the city doesn’t offer many opportunities for them to develop their surefootedness. Seems like they have their dad’s genes in this respect (or my latent rock hopping genes that have yet to really start expressing themselves). Enjoying a late sunset at Mt Maunganui beach. Located right across from the Mount Maunganui main beach, which has been voted the best beach in New Zealand in recent years, we had a gorgeous evening walk along it and the girls picked up at least 1 kg of shells! We then had a lovely dip in the Apartment hot pool that was so inviting after that breezy walk. The next day, we slept in (thanks to a food coma from the Indian takeaway the night before from Great Spice) and only got up around 10:30 am, which is extremely late for kiwis. Most shops and cafes open here around 6:30am or 7am! TIP: for family holidays that are already packed to the gills on other days, blanks in the itinerary are always a good thing! After reviewing suggestions on Tripadvisor, we decided to summit the Mount, as the namesake mountain is fondly referred to. Ranked as Tripadvisor's #1 Thing To Do in the area, we figured we might as well get in another hike before our big one (the Tongariro Alpine Crossing, in 2 day’s time). Touted as a “challenging walk" by some, and an "easy walk" by others, we threw caution to the wind and walked up laden with bags of food, as we had missed our time slot for lunch. The walk was relatively challenging at parts, as it is a steep walk (especially for us city folk) but the views were well worth it! Day 8: Out looking for dolphins...ending up with a great day for sailing & conversation! 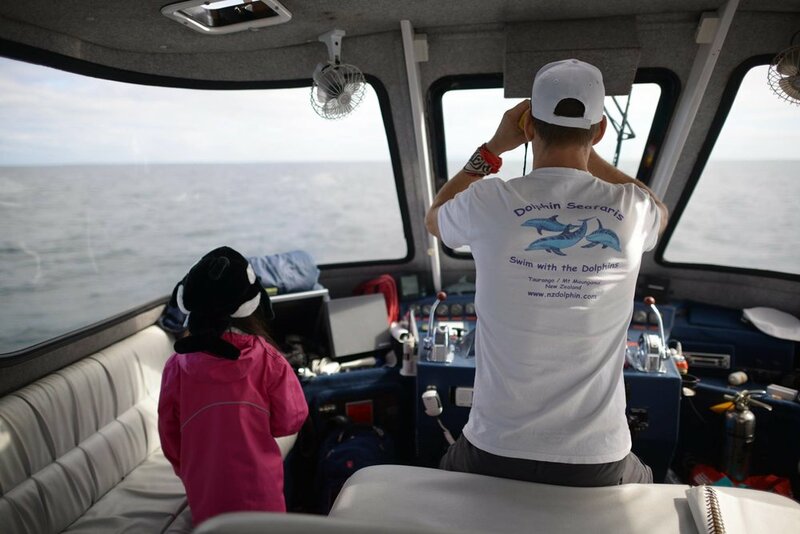 The next day, we set off early to Dolphin Seafaris, a company owned and operated by our fellow Tony Robbins friend Cameron Fines, for a day of wild dolphin swimming. As it goes with wildlife, some things just can't be forced, and due to the presence of some orca in the area, the dolphins were nowhere to be found. We did see some Little Blue Penguins (kororu) dipping in and out of the water though! That said, we had a great time catching the sun rays on the boat and enjoying a beautiful day at sea, having a good catch up with Cameron. 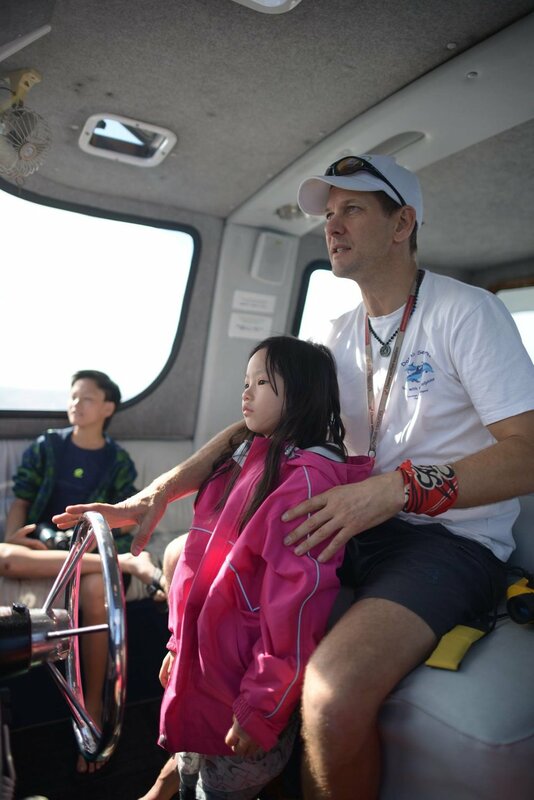 The kids even got to try their hands at driving the boat! Click to check out Dolphin Seafaris! After a morning of sailing and attempts at dolphin spotting, we headed to Mount Hot Pools that evening to soak in some minerals in the naturally heated water before drifting off to a nice relaxed sleep. Up next... Rotorua and Tongariro!